This famous sport is also known as the most important thing of all unimportant things. And for all football lovers here comes the game they will certainly enjoy - Football: Champions Cup! This amusing sporty pokie was released by the NetEnt software development company, based in Sweden and Malta. Taking into account the prevalence of this sport around the world, it can be said that this slot is a great creation that has the potential to attract a large number of players. And is there a better football event than the Champions Cup? 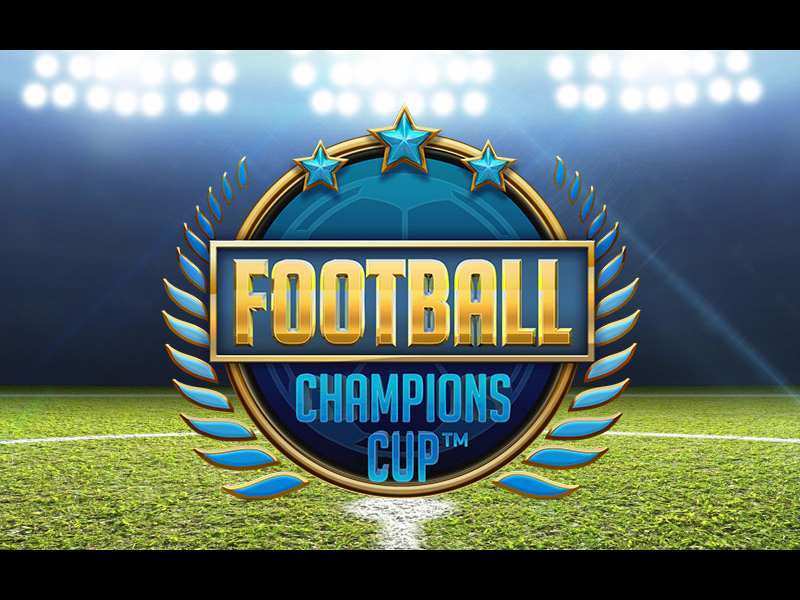 Football: Champions Cup is a video slot that contains 5 reels and 20 paylines and is definitely all about football. The first thing that pops out when the player starts the game is a window displaying flags (languages) one can choose from. The design of this introductory page gives one a feeling like he is actually choosing a national football team in order to participate in Champions cup tournament. A really nice touch. The theme is set directly in the stadium and one can see overcrowded stands and some headlights on the left and right of the reels. Sound effects in a form of the cheering crowd complete the impression and provide one the feeling like he’s actually at the stadium itself. It can be played for free, with no need for download or registration. There is also a mobile version of this amazing slot. It runs smoothly both of the leading platforms, Android and iOS. One doesn’t need to install any specific app, the game can be easily accessed through device’s internet browser. This means that one can play it even on the move! One can find this slot simply by visiting Money Online Slots or by visiting slot provider’s website. The wild is illustrated as a ball. It can substitute all the tokens, except for the bonus and scatter ones, in order for one to complete his winning combination more easily. It can also form a winning combo on its own when there are 3 or more placed consecutively on the columns. It also acts as an overlay wild, which means that between 2 and 5 of them can appear in the base game. those wilds can’t land on top of other wild tokens, scatter or bonus symbol. The scatter comes in a form of Champions Cup. For 3 or more of them landed in any position on the reels 2, 3 and 4, one would trigger the free spins tournament mode. Every round played in this mode is actually a football game and if the player wins the match, he would advance to the next round simultaneously reactivating the free spins mode. The maximal number of rounds is 4 and each round contains 6 costless rolls. In the end, there are prizes for the 3rd (x20 bet multiplier), 2nd (x100 bet multiplier) and the 1st (x500 bet multiplier) place. During the free spins feature, there are additional so-called scoring wilds that activate goal scoring for the player or for his opponent, depending on their position on the reels. Blue scoring wild triggers the goal for the player and it appears on reels 1 and 2. Red scoring wild scores a goal for the opponent and it can land on reels 4 and 5. Bonus icon activates the additional bonus round when one manages to land 3 or more of them anywhere on the reels. It contains some useful multipliers which value depends on the number of bonus tokens landed. This feature is actually a penalty shootout game that initially has 5 rounds. First, the player picks one of the four positions to shoot and after that, the roles are switched, the bettor becomes the goalkeeper and chooses one out of four positions to try to save the opponent’s shot. So, if one wants to play free Football: Champions Cup casino slot machine, whether he is from the UK or any other country, he can do that simply by going to previously mentioned Money Online Slots. There one can find more sporty slots, such as Alaskan Fishing. There is no doubt that this pokie will provide thrill and enjoyment, especially for football fans, with its outstanding features (overlay wild, scoring wilds), additional bonus rounds and free spins tournaments. All of this combined with killer, top-notch graphics and realistic sound effects should set this game at the top of any slot lover’s list. 0 responses to "Football: Champions Cup Slot"